SOME KIND OF RELIGION FOUND AMONG ALL MEN--CLASSIFICATIONS OF RELIGIONS--THE PURPOSE OF RELIGIONS--RELIGIONS OF RITE AND OF CREED--THE MYTH GROWS IN THE FIRST OF THESE--INTENT AND MEANING OF THE MYTH. PROCESSES OF MYTH-BUILDING IN AMERICA--PERSONIFICATION. PARONYMS AND HOMONYMS--OTOSIS--POLYONOMY--HENOTHEISM--BORROWING--RHETORICAL FIGURES--ABSTRACT EXPRESSIONS. ESOTERIC TEACHINGS. 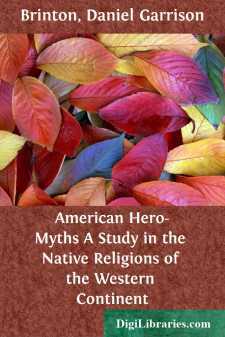 OUTLINES OF THE FUNDAMENTAL AMERICAN MYTH--THE WHITE CULTURE-HERO AND THE FOUR BROTHERS--INTERPRETATION OF THE MYTH--COMPARISON WITH THE ARYAN HERMES MYTH--WITH THE ARYO-SEMITIC CADMUS MYTH--WITH OSIRIAN MYTHS--THE MYTH OF THE VIRGIN MOTHER--THE INTERPRETATION THUS SUPPORTED. The time was, and that not so very long ago, when it was contended by some that there are tribes of men without any sort of religion; nowadays the effort is to show that the feeling which prompts to it is common, even among brutes. This change of opinion has come about partly through an extension of the definition of religion. It is now held to mean any kind of belief in spiritual or extra-natural agencies. Some learned men say that we had better drop the word "religion," lest we be misunderstood. They would rather use "daimonism," or "supernaturalism," or other such new term; but none of these seems to me so wide and so exactly significant of what I mean as "religion." All now agree that in this very broad sense some kind of religion exists in every human community. The attempt has often been made to classify these various faiths under some few general headings. The scheme of Auguste Comte still has supporters. He taught that man begins with fetichism, advances to polytheism, and at last rises to monotheism. More in vogue at present is the theory that the simplest and lowest form of religion is individual; above it are the national religions; and at the summit the universal or world religions. Comte's scheme has not borne examination. It is artificial and sterile. Look at Christianity. It is the highest of all religions, but it is not monotheism. Look at Buddhism. In its pure form it is not even theism. The second classification is more fruitful for historical purposes. The psychologist, however, inquires as to the essence, the real purpose of religions. This has been differently defined by the two great schools of thought. All religions, says the idealist, are the efforts, poor or noble, conscious or blind, to develop the Idea of God in the soul of man. No, replies the rationalist, it is simply the effort of the human mind to frame a Theory of Things; at first, religion is an early system of natural philosophy; later it becomes moral philosophy. Explain the Universe by physical laws, point out that the origin and aim of ethics are the relations of men, and we shall have no more religions, nor need any.